The Government last night voted for new laws which will allow all retail outlets to open on Boxing Day if they choose. I know many people enjoy the Boxing Day sales, and I know some retail workers are happy to work on Boxing Day, but I opposed this legislation for a number of reasons. I am definitely with the workers on this one and believe that Boxing Day is a day better spent with family and friends. I would prefer to see Boxing Day remain a true and proper public holiday for workers in non-essential industry, and that we protected the two-day Christmas-Boxing Day holiday and not consigned it to history for the sake of some (mostly larger) retailers. Mr GREG PIPER ( Lake Macquarie ) ( 17:29 ): I come to this debate not as an ideological warrior from the conservatives or from the left of politics but to consider the matter objectively. I have reached the conclusion that I will not support the Retail Trading Amendment (Boxing Day) Bill 2017. I accept some but not all of the arguments mounted in favour of the bill by Government members. I accept some but not all of what Percy Allan found in his research. I accept many of the arguments mounted by business and retail groups but also by the unions in defence of their position. However, I cannot support the bill for a number of reasons, the most important being a lack of balance. Primarily I believe the work/life balance of Australian families is out of whack and drifting dangerously. I rarely stray into the sphere of traditionalism when talking about social structures and norms but the Christmas?Boxing Day tradition of getting together with family and friends will be damaged forever for many people in this State should this bill pass and it will become just a normal trading day. I believe this break has evolved from being largely a traditional Christian celebration to something that is more broadly about getting together with family and friends and about building community. For many, it is a barbecue at the beach. For others, it is more about watching the Boxing Day cricket test. It is an institution which, although changed over the years, is still at the heart of our societal norms. This bill seeks to take that away for many residents of New South Wales, not just for a trial year or two but forever. This bill, if passed, will remove the opportunity hundreds of thousands of Australian workers have for a day off with family and friends. These are mostly young retail workers who could probably do with a day off after the busy retail period leading up to Christmas. I accept that many young workers want to work on Boxing Day and want to earn a little bit extra for their pockets, but that work will still be there the day after Boxing Day and the day after that. People with money to spend at the Boxing Day retail sales will still spend it. I have heard arguments about the economy but this is in the realm of voodoo economics if we believe that an extra day of trading will add significantly to the New South Wales economy. The Boxing Day sales are not held just on Boxing Day; they run for two weeks and in some cases a month. Nobody is missing out on anything if the retail sector and banks stay closed for one extra day of the year. Is the economy really at risk from maintaining Boxing Day ostensibly as a holiday? If so, we as a society need to consider what we have become and the balance we accept between an economy and a community. Are things so tight that we have to squeeze the last bit of life and money out of everyone and their wallets for the sake of a bit of retail activity that will happen regardless of when the shops reopen after Christmas? I do not want this to become the accepted thing, when Boxing Day is no longer about everyone having the day off with family and friends because half the country is back at work. Obviously, there are exceptions to this rule. Our amazing emergency services personnel, our doctors and nurses and the like, have always worked through the traditional Christmas break. We all appreciate the work of people in those essential roles. Indeed, I spent nearly 20 years working on Christmas Day and Boxing Day, but that is not the point. Selling a pair of half?priced jeans is not an essential service. The jeans can still be sold tomorrow, the next day or any day after that. Much of this bill goes to the protection of workers who do not want to work on Boxing Day. While I am pleased that the Minister has sought to include those protections in the bill, they are also a very strong concession that many people simply do not want to work on Boxing Day. They would rather spend that extra time with family and friends over Christmas Day and Boxing Day. I know that the Minister has talked a great deal about giving retailers and workers the choice on Boxing Day trade, but for many it is not a choice they even want to make. What this bill creates is pressure on retailers who do not want to open on Boxing Day but are essentially forced to open because the shopping mall they are located in is open, their competition is open or because they feel as though they will miss out on some of that retail spend. It does not have to be that way. Certainly, this bill will eliminate the ridiculous scenarios that we saw prior to 2015 when some stores and shopping malls were allowed to open and others were not. This was true in my own electorate, in neighbouring Newcastle and on the Central Coast. 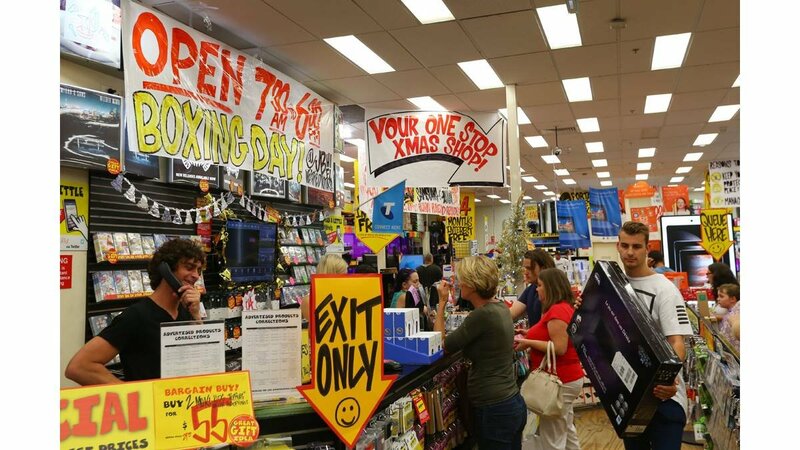 But while granting all the retailers and banks a Boxing Day free-for-all might get rid of that problem, we are creating another one and taking away a day for many people that is as sacred to Australian families as the Boxing Day cricket test itself. As I said earlier, the world has changed; it is getting faster and the work/life balance is wrong for countless Australians, particularly many who will succumb to unspoken or subtle pressure and agree to work rather than spend time with family and friends. I am definitely with the workers on this one. I would prefer to see the Boxing Day public holiday remain a true and proper public holiday for workers in non-essential industry. I would prefer that we protected the traditional two-day Christmas-Boxing Day spell and not consign it to history for the sake of a half-price T-shirt that will still be half price the next day. I say to the Minister and those supporting this bill—and similar words have been stated by others before me: "What will you be doing on Boxing Day this year? Will you be spending valuable time with your family and friends, relaxing on the beach, playing cricket with the kids or having a barbecue with the neighbours, or will you be missing out because you got called into a 12-hour shift at work?" It is a rhetorical question. An economy is important but society should not be subservient to it. This bill will not see the collapse of society but it certainly does not add to it. I do not support the bill.